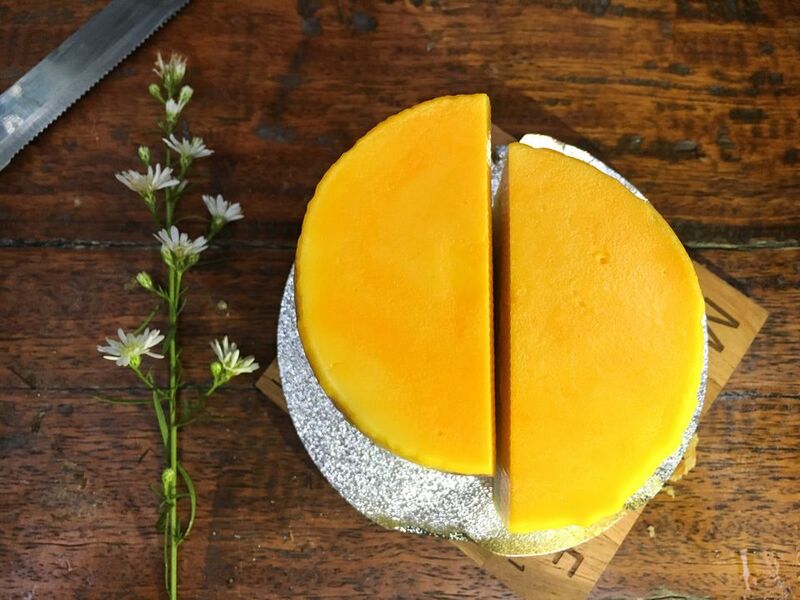 When you're looking for the smoothest, most scrumptious cheesecake, the exotic flavor of this mango cheesecake recipe is hard to beat. It's irresistible and beautiful, even giving you the chance to play with decorative swirls that will impress anyone. This is the perfect dessert for family dinners and small parties, and everyone will love it. This is a simple recipe that is fun and easy to make, even if it's your first attempt at real cheesecake. You'll find a few tips that will help along the way. It's easy to serve, too. Simply take it out of the refrigerator and slice it up. Preheat oven to 350 F. Prepare a springform pan by lining it with tin foil or parchment paper. You can also use a standard cake pan or several ramekins. Grease either with butter or coconut oil. In a large bowl, stir room-temperature or microwave-warmed butter into cracker crumbs (or pulse in the processor to combine). Press into the bottom of the prepared pan to make a bottom crust. Set in refrigerator. Place fresh mango slices in a food processor or blender. Add 2 tablespoons water and the coconut flavoring (if using). Blend well to make a thick puree. If using fresh mango, you may want to add 2 teaspoons sugar to sweeten it. Set aside. Place the cream cheese in a large mixing bowl. If it's cold, cover with a plate and microwave for 1 to 2 minutes until soft. Add sugar and beat at low speed until smooth. Begin adding eggs, one at a time, beating at low speed. This can also be done by hand with a whisk to avoid over-beating. Add half the mango puree into the cream cheese mixture and sprinkle with flour. Mix on low speed or by hand just until incorporated. Pour batter into the prepared pan(s) and smooth out the top. Now the fun part; drizzle the remaining puree onto the surface of the cake in 3 horizontal lines or dots all over the surface. With a cake tester, skewer, or thin-bladed knife, swirl the batter and puree together using wide circular movements. Bake for 1 hour, or 10 minutes longer if the cake appears undercooked. Keep in mind that the top of cheesecake will always be a little jiggly, but it will firm up later. Allow the cheesecake to cool in the pan before removing. Refrigerate until ready to serve. Cracks are the most common flaw in cheesecakes, but there are tips to try and prevent them. The best option is to set a pan of water on one of the lower racks of your oven while baking the cheesecake. You can also gently tap the pan on the counter just before baking to release some air. The small amount of flour in this recipe was added for this purpose as well.